The leading Blended Scotch Whisky LABEL 5 reveals two gift boxes for the end of the year available worldwide for its two flagship products: LABEL 5 Classic Black and LABEL 5 Extra Premium 12 years old. Continuing the saga “Citizen of the World”, the new design of the LABEL 5 Classic Black gift box will please all the gift givers. Through this new artwork featuring an illustration with buildings and lights, the brand remains faithful to its positioning and identity – a modern, urban and dynamic Blended Scotch Whisky. With two glasses engraved with a “5” inside, this gift box will be a must-have! LABEL 5 Extra Premium 12 yo. comes as an elegant and sophisticated gift box with two designed glasses. A perfect gift idea for whisky lovers who are willing to taste an exceptional Scotch Whisky of superior quality, highly awarded this year. 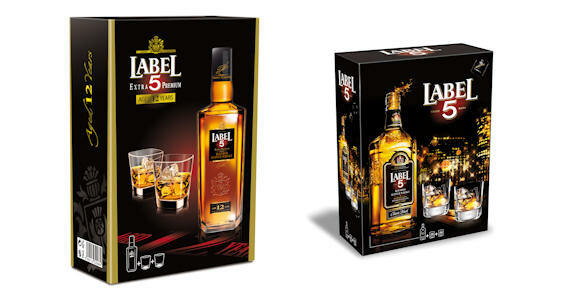 Please enjoy LABEL 5 responsibly.